You can either make a booking directly on this website by using the "check availability box" to the left. Or you can call our office at 888-333-5881 and a receptionist will be glad to help you. In securing your reservation you will be asked for personal information such as; name, address, telephone number, email address, and billing information. You will only be contacted in regards to your reservation unless you specifically request to be added to our mailing list. 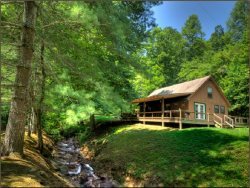 Hidden Creek Cabins not sell, trade, or otherwise transfer to outside parties your personally identifiable information. This does not include trusted third parties who assist us in operating our website, conducting our business, or servicing you, so long as those parties agree to keep this information confidential. We may also release your information when appropriate to comply with the law, enforce our site policies, or protect ours or others rights, property, or safety.